Martha Magenta lives in Bristol, UK. Her haiku, haibun, senryu, and tanka have appeared in many journals and anthologies. She was awarded Honorable Mentions in contests for haiku, tanka and haibun in 2017/2018. 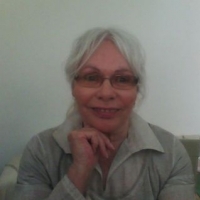 She is listed on The European Top 100 haiku authors, 2017. Credits: "lunar eclipse" - Shamrock Haiku Journal (June, 2017); "starry night" - The Wonder Code 2017, Scott Mason, Girasole Press [first published in The Heron's Nest Vol. XVIII, No. 4, December 2016]; "wind in the wires" - Presence, (no. 59, Nov. 2017); "from somewhere" - hedgerow (issue 104, Feb. 2017); "halo moon" Chrysanthemum (issue 22, Oct. 2017; "sparkling cider" - Akitsu Quarterly (Spring, 2017).